CROWN showcased Advanced Material Handling Technologies on Stand 10J61 at IMHX 2016. Quick Pick Remote Order Picking Technology - available on all Crown’s order pickers, MPC multi-purpose lift trucks and TC tow tractors, remotely advances the truck to the next picking position via the wrist-mounted “magic glove”. The company says functionality is enhanced with the ability to remotely control lift/lower functions on nearly all Crown stackers. RFID-based Auto Fence and Auto Positioning Systems for TSP Series turret trucks - launched in the UK at IMHX, Auto Fence controls truck operation near a hazard or where caution is required and Auto Positioning automates travel and lift functions for the most efficient path to the truck’s destinations. 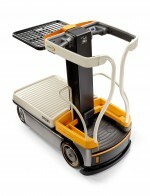 Li-Ion-ready range extended – in addition to Crown’s 24-Volt trucks, Lithium-Ion ready variants are now available on 48-Volt machines, including SC 6000 counterbalance and ESR 5200 reach trucks. Crown’s new WAV 60 Work Assist® Vehicle debuted at IMHX 2016. Bringing safety, efficiency and flexibility where ladders are typically used up to five metres. AC power, up to 8 km/h and Access 1 2 3 system guarantee optimum performance. Engineering and manufacturing companies of any size could fill skills gaps by using the Government’s new apprenticeship levy, which comes into force on 6 April. For the first time, employees aged 24 and over will attract 90% funding for apprenticeship training, with no upper age limit and with eligibility for graduates. PWE reports.